Hero Arts and A2Z Scrapbooking Digital Blog Hop! Hello everyone and happy Monday to you!! Today we are excited that Hero Arts will be hosting a blog hop with A2Z Scrapbooking, their new digital retailers. Currently, a2z Scrapboooking offers a selection of Hero Arts digital goodies, but in the coming weeks, they will be adding to their collection and stocking Hero Arts entire range. To celebrate Hero Arts new collaboration, a number of artists from a2z Scrapbooking and Hero Arts, teamed up to provide you with a whole host of inspiration and fun. Just hop along and see how our digital products can be used. You should be arriving from Kelly Latevola’s blog. If this is your first stop you’ll want to begin at Hero Arts blog so you don’t miss out on any of the fun, interesting projects we are sharing. And to add to the excitement, a2z Scrapbooking will be giving away a $50 gift certificate to one lucky commenter. Prize winners will be randomly selected from ALL Comments received on the participating designer’s blogs. The more comment you leave along the hop, the better your odds of winning, so be sure to comment on every blog, starting with this Hero Arts blog!! You have until Sunday August 31st at 11:59 EST to leave your comments and the winner will be announced on the 3rd of September on the a2z Scrapbooking blog. So now on to the fun!! I wanted to stay with a2z scrapbooking current theme of encouragement so I created a series of cards that boost encouragement. 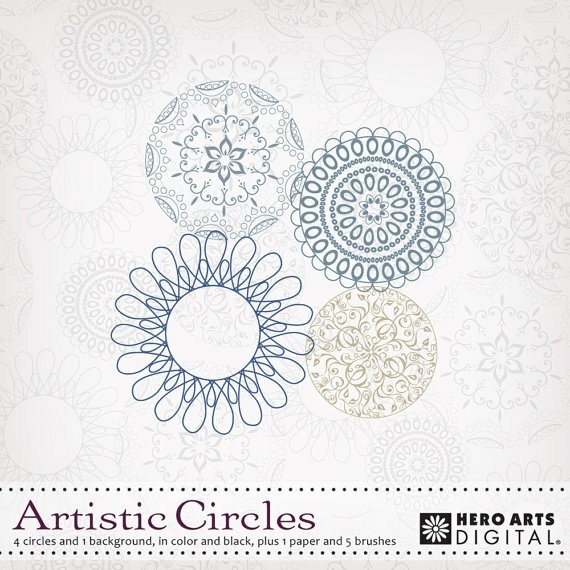 I used Hero Arts Digital Artistic Circles!! This set of circles are amazing!! They are a must have. So what do you think? Its a must have digital set, right!! I totally agree! These cards were so easy to create. I created these card panels in Photoshop, but any photo editing software would work. I sized and resized each circle so that they were centered on each card panel. That didn’t take long at all. Once my placement was create I printed one sheet and cut my panels down to 4 x 5.25. Then I colored each of the circles with different mediums and added Hero Arts Gems to the center of each circle. I used each medium to color the gem. To stay with the digital theme, I created each sentiment in Photoshop and cut them out, flagged them and added them to the front of the card. I tied bakers twine around the card panel for more detail. I added foam adhesive to back of each card panel and adhered that to the card base. If you would like any of the products that I used on this card please head on over to the a2z Scrapbooking store and use the coupon code KYMONA15 to get 15% off your entire purchase. Now on to the Fabulous Lisa Spangler blog to see what she has come up with!!! Just in case you missed anyone here is the entire list of blogs participating in the hop! Have fun on your hop today! « Mug Swap Send Off!! Really cute set of cards. Would make a nice gift set. Hey Tammy!! Thank you so much for your kind comment!! Beautiful colors – great set! Hey momrc!! Thank you so much for your kind comment. That set is beautiful and looks very easy to make! Those are the kind I like! Thanks for the idea with the circle! Hey maraclesusan! Thank you so much for your kind words. Yes, this set of cards took no time. The coloring was the longest part of the process. You must try it. Wonderful set of cards! Love how you colored the images leaving lots of white space. Hey Miriam!! Thank you so much for your kind comment. I am a CAS gal. I love white space. Beautiful sets of cards! I love how many fabulous ideas you’ve already show us with this set and now I know I MUST have it!! I’m in LOVE with the “purple” version and now want to try and see what I can do! So happy to see you here in the HOP and totally having fun creating with you and all the a2z Design Team!! Hey Lisa!!! Thank you so much for your wonderful comment. Yes, the purple card is my favorite. The colors really rock on that card. I love being this team too. You ladies are phenomenal. So much talent in one place, I totally love it. Hey Shari!! Thank you so much for your kind comment. I had fun coloring those circles. A great series of cards – you did a great job on each of them – what a lovely set it turned out to be – have a happy day! Hey Gail! Thank you so much for your kind comment. I had a lot of fun working on this set of circles. The circle creations remind me of the wonderful times I had with a product called Spirograph that I had when I was younger. Hey Melissa!! Thank you so much for your wonderful comment. Yes, you are right they do remind me of a Spirograph. How cool is that! Such amazingly beautiful and inspirational cards!! I feel like you might be speaking to me with some simple advice – Be Fearless, Be Generous, Be Strong, Be Yourself!! Love the strong sense of “you can do it” these cards and messages send!! The coloring on each one makes them all seem so different even though the images are the same – WOW , you rocked this!!! Hey Taunya!! Yes girl, I’m talking to you. Those are my words of encouragement to you!! I want you to say around in the blog world! What a gorgeous set of cards! I love your design and beautiful colouring! Hey Heather!! Thank you so much for your kind comment. I’m a CAS gal, I think one focal point makes the cards elegant. Such a striking card set, love the beautiful colors!!! Hey Kailash! Thank you so much for your kind comment. I love the way you colored each circle a different color and added a different strong sentiment to each these would be great cards to bundle up and give as a gift or send one at a time to some.one who may need some encouragement just lovely each and every one! Hey Deborah!! Thank you so much for your kind comment. That is what I was thinking when I created those cards. I wanted to give words of encouragement. super creative card, and the sentiments are so wonderful! Hey Amante del Papel!! Thank you so much for your kind comment. Those sentiment hangs on a canvas above my computer. I see them everyday. Powerful. Such a beautiful collection of cards, Kymona! I love how you used different mediums to color them, and that you kept your design CAS! You’ve done an amazing job with the digi’s! Hey Barb! Thank you for your kind comment. CAS is my style!! I wanted to try the different mediums because I don’t all ways get to use them. I’ve never used distress markers. I have them just never used them so I thought this was the perfect time to pull them out. Love the colors and the added sparkle with the gem! Hey Diana! Thank you so much for your kind comment. The purple one is my favorite. These are gorgeous! These would make a beautiful gift. I agree with Melissa they remind me of a spirograph. And the messages would be great for a middle school girl:) Thank you for participating in the hop! Hey Linda!! Thank you so much for your kind words. Your right this set would be perfect for middle school and high school girls group. That is on my raider now. Hey Melissa! Thank you so much for your kind comment. Gorgeous card set, Kymona! I love the colours and the twine finishes them off so nicely! Hey Emily!!! Thank you so much for your kind comment!! I hope your enjoying the hop. Pingback: Hero Arts + A2Z Scrapbooking Digital Blog Hop + Giveaway! Hey Debs!! Thank you do much for your kind comment! I had a lot of fun coloring. 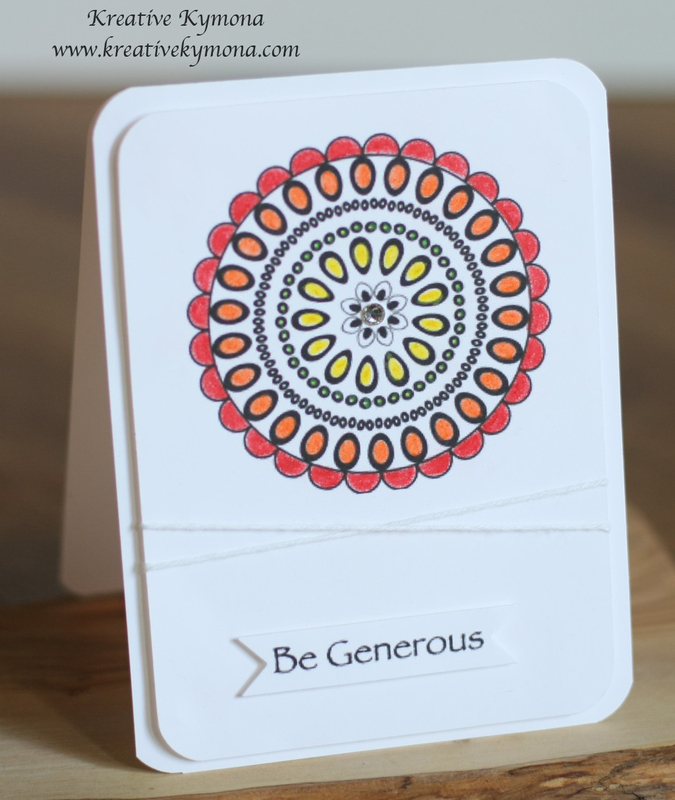 Really love this “Be” series…I enjoy coloring mandalas, and I appreciated your strong “Be” encouragement, too. And the Maya Angelou quote on your blog! Lots of inspiration here, thanks! Hey Barbara-Jean!! Thank you so much for your kind words. I’m into encouragement. Young women and men need a lot of it. I have to children and I need them to know that they are wonderful no matter what people say. I love Maya Angelou!! Her and I shared the same birthday! I completely agree it is a must have. A boxed set of gorgeous notecards would be a wonderful gift. Thank you for sharing! Hey Lercy!! Thank you for your kind comment. You have to see the other images in the set. Simple beautiful. Hey Carmen!! Thank you so much for your kind comment. Yes, open that photoshop and create! I’m so happy you like the hop. I hope it really gets your creative juices flowing. I use a Inkjet Epson XP-810, nothing fancy. I print everything with that printer. Oooo, a laser jet, that’s nice. Hey Paulina!! Thank you so much for your kind comment. I hope you come and visit again. Love your cards! What a great and easy gift idea. Hey Thalia!! Thank you so much for your kind comment. Yes, your right a this would make a great gift card set. Wow!! Your cards are so lovely. I love that you made 4 cards that were so similar but they are different. (redundant, I know!) However, I LOVE each and every one. Your color choices rock and I love the added touch of the twine. And these are DIGITAL images. I have not tried to use digital images because I am so afraid that the color will bleed when I try to ink them with Copics. I do not have a laser printer, though I am trying to convince my husband to buy one. Thank you for the lovely inspiration!! Hey Nora!! Thank you for your wonderful comment. Yes, they are digital images!! You can work magic with them. I wasn’t a big user of digital images either but have really grown to love them. I do not have a laser printer. I have an Epson XP-810 printer that I got off of Amazon for under $200. It handles my thick card stock well. No laser for me. Hey Linda!! Thank you so much for your wonderful comment. These cards look great…love the CAS design and the variety of sentiments. Thanks for giving us the details on how you printed out this digi with the dimensions too. I can totally see this a quick and easy gift card set. Hey Mary-Anne!!! Thank you so much for your kind comment. Yes, reproducing these cards are so easy. I had fun working with this digi file. You should give this a try! That’s very versatile. Do you plan out your colors or just follow your whimsy? Hey Twyladavis!! Thank you for your kind comment. In regards to my coloring, I just followed my whimsy. I knew I wanted to use the different mediums because not everyone use just one set. So I wanted so show how all of them hold up. You should give them a try. These are beautiful! I really like how you used different colouring media with equal effectiveness. Hey Lindsey!! Thank you so much for your kind comment. I chose to use different mediums because I know we have have different types of markers and color pencils. Love the Be set.. I would definetly buy them..
Hey Erica!! Thank you so much for your sweet comment. Beautiful cards! 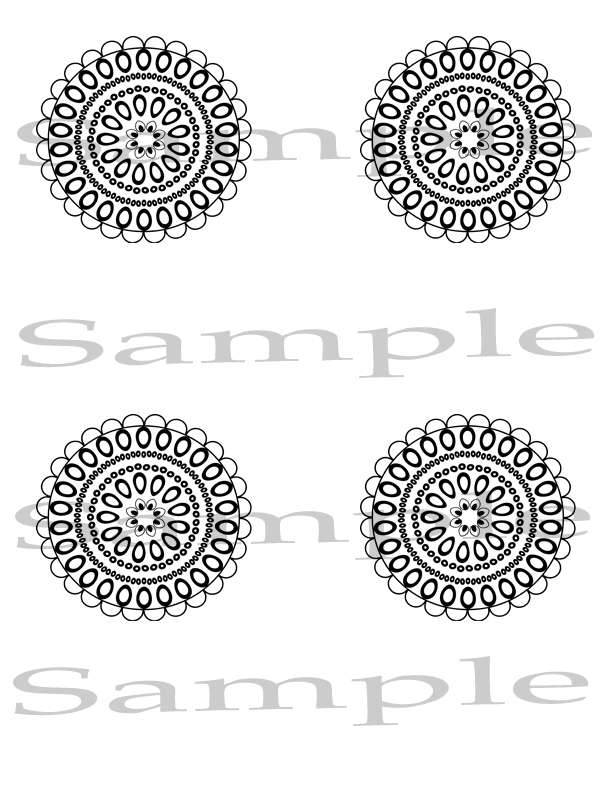 I am a big fan of medallions and this set is just wonderful. Love the colors and sentiments. Hey Denise!! Thank you so much for your kind comment. Yes, I love medallions too. They are fun to work with. I hope you give this digi file a try. wow these are so simple but NICE!!! Hey Rubeena! Thank you so much for your kind words. I’m glad you liked that set of cards. What a beautiful set of cards! I love this design and your coloring is so pretty. Hey Joy!! Thank you for your kind words. 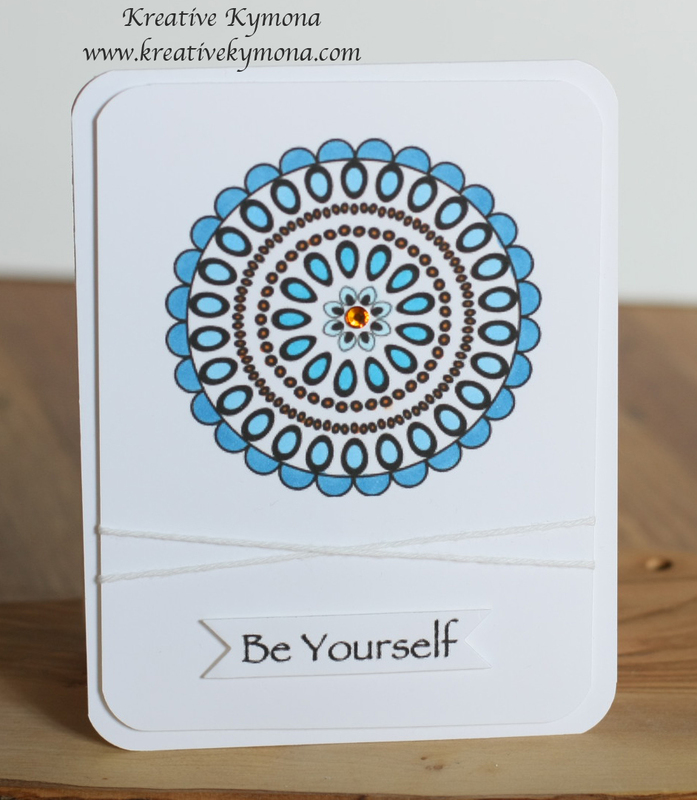 Creating this set of cards really showed me that coloring is the best medicine for stress!! Those circles are fun and different. Nice coloring on them! Hello Karen! Thank you so much for your kind comment. Yes, working with those circles was a lot of fun. I love your card set. Such great coloring and sentiments. Thank you for sharing. Hey Carol!! Thank you so much for your kind words. What a cool set of cards! Love how you kept the “encouragement” theme throughout, and colored the images with different mediums. Thanks also for the tips on how to do these–I always love to hear how crafters create their projects. Hope you have an excellent day! Hey Andrea!! Thank you so much for your kind comment. Your welcome! I love to share how I make my cards because I love to see other people try and make them too. So I hope you try these cards out. They are easy to use. I just love your card set – they are truly beautiful!! Hey Jen! Thank you so much for your kind comment!! I hope you give this circles a try. Hey Rachael! Thank you for your kind comment.